Charge module- Switch mode charging. Work temperature- -10°C to +85°C. Inversed polarity protection – NO. 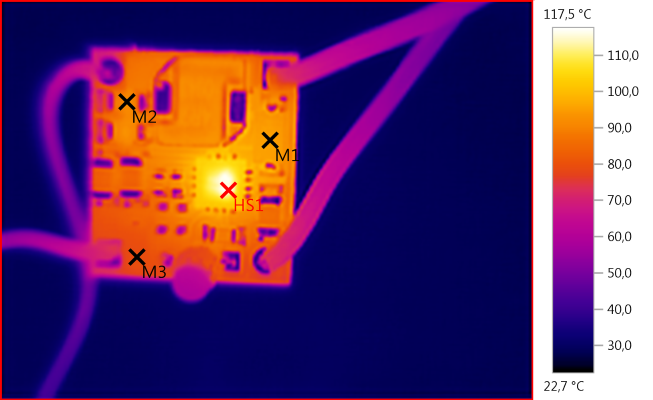 The above specifications are not completely correct, the module I got was configured for 2A charging. The regulator is a switcher with an inductor. 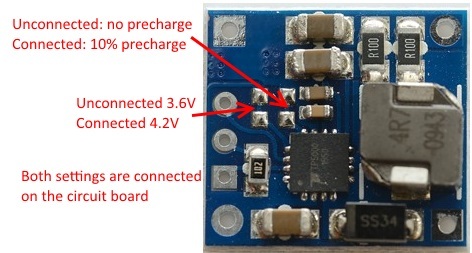 Default selection is 4.2 volt with 10% precharge current, to enable the other function a knife must be used to cut the trace between the two solder points. Discharge with 2uA when not connected to power. 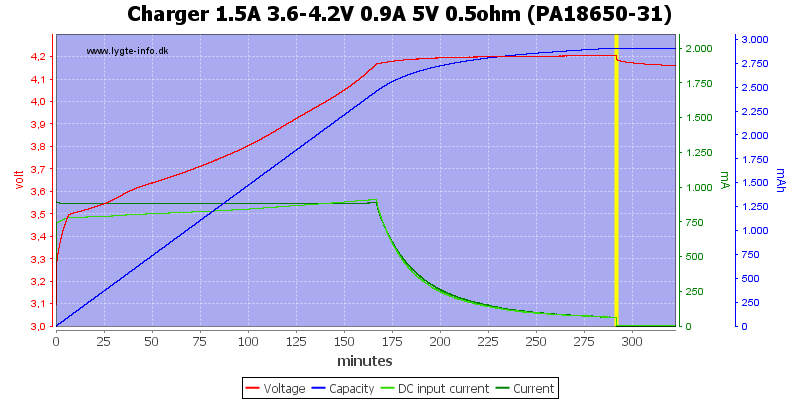 Discharge with 6uA when connected to power (5 volt supply). 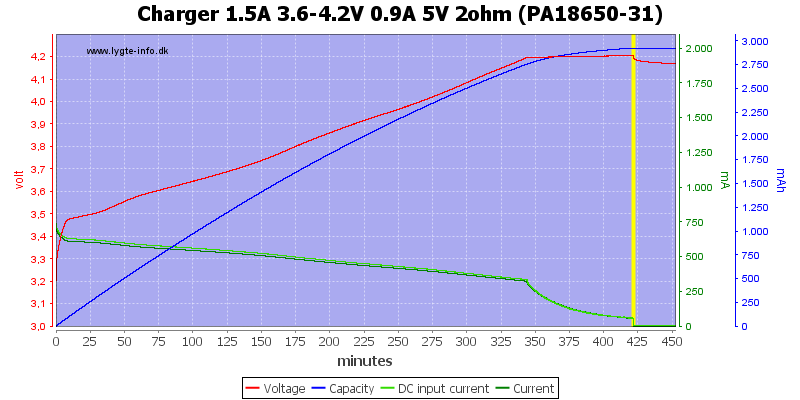 This looks like a very good CC/CV voltage charge curve with termination at 10% of charge current, here 200mA, the current is slightly below 2A due to heat. 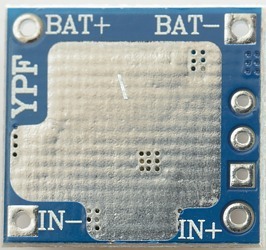 The chip gets fairly hot and reduces the charge current. 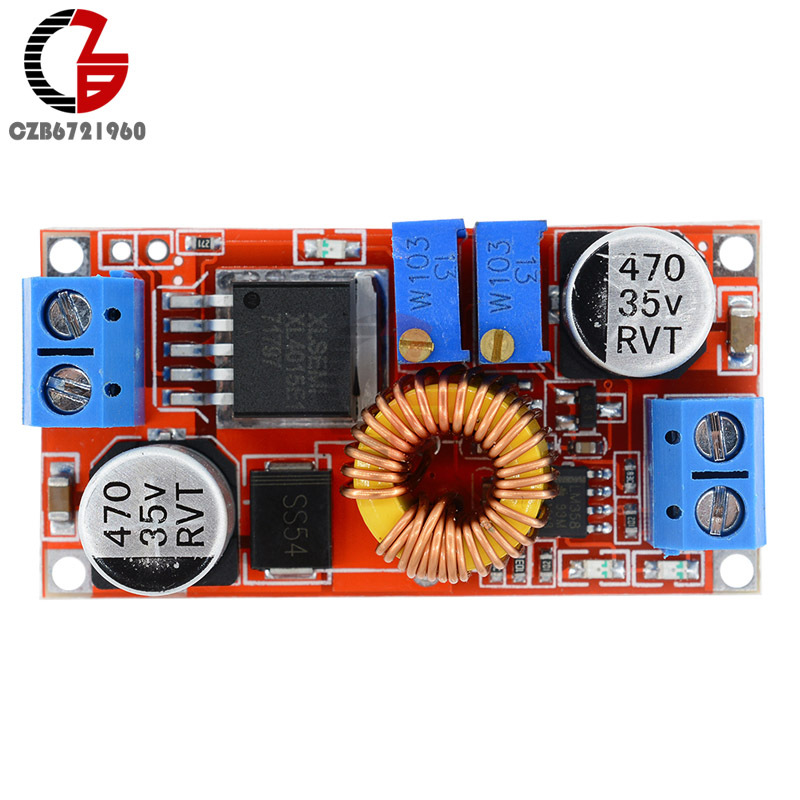 With the higher input voltage the charge circuit could not maintain full charge current, it got too hot and regulated the current down. 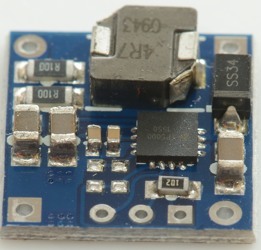 With 9V input the diode gets very hot, this make the circuit board hotter and the chip has to reduce the current even more. 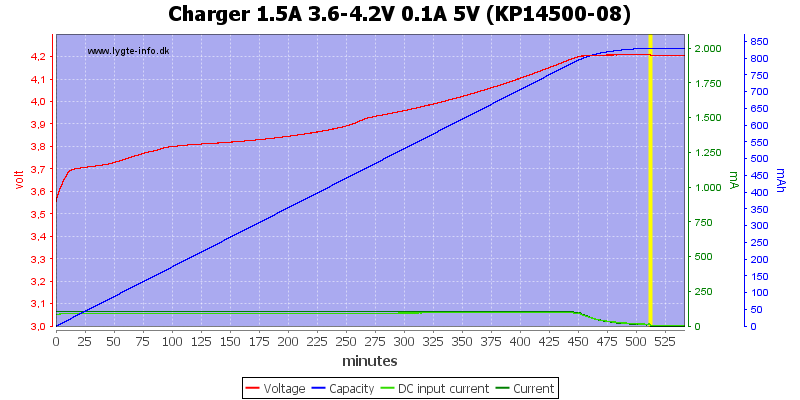 At 1A charging current the CC/CV voltage charge curve also looks fine. 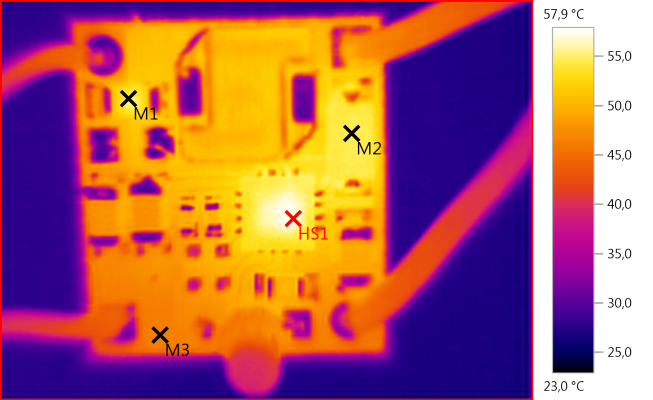 1A current looks much more acceptable in temperature, nothing is really hot here (At least for electronic). 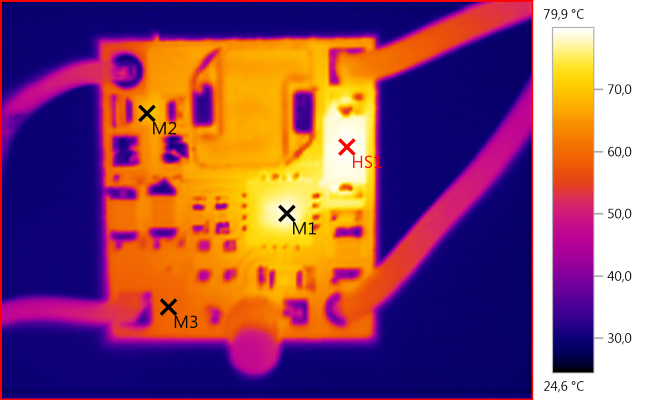 At 1A there is no heat problem with 9V input. 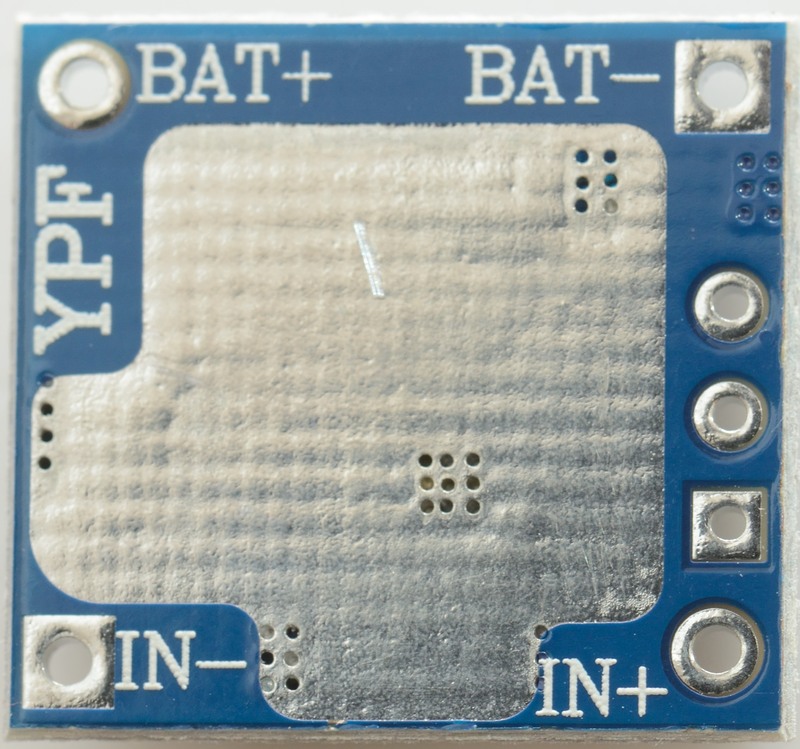 With 9V input the diode gets warm again and increases the temperature of the chip, but it is still acceptable temperatures for electronic. 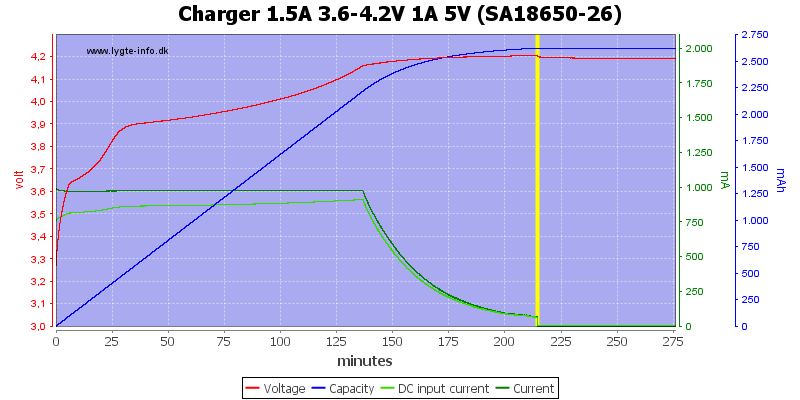 Both the new and old 2600mAh battery was charged perfectly. Replacing the two 0.1ohm resistors with a single 1ohm resistor the current is down to 0.1A. 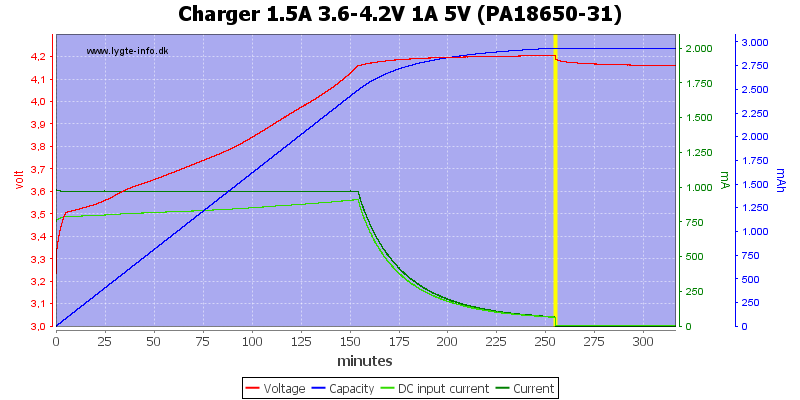 I tested with a 14500 cell and it was charged perfectly to 4.2 volt, but with this low current ot took some time (0.1A is for smaller cells). Simulating a long cable from a USB supply did not really affect the charger. 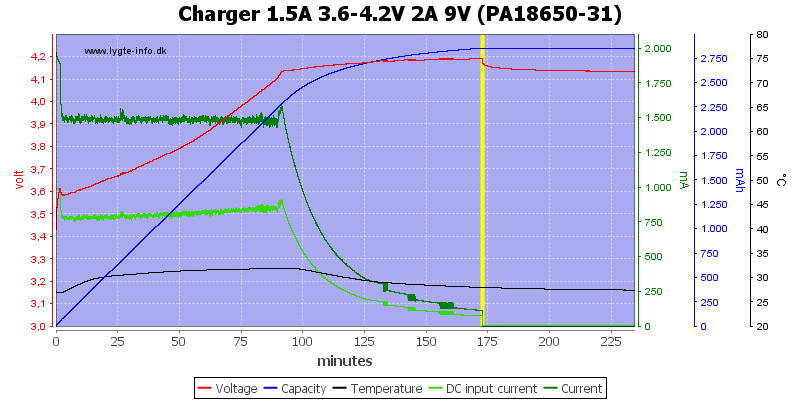 Adding more resistance between the 5V and the charger will slow down the charging, but the battery is filled. 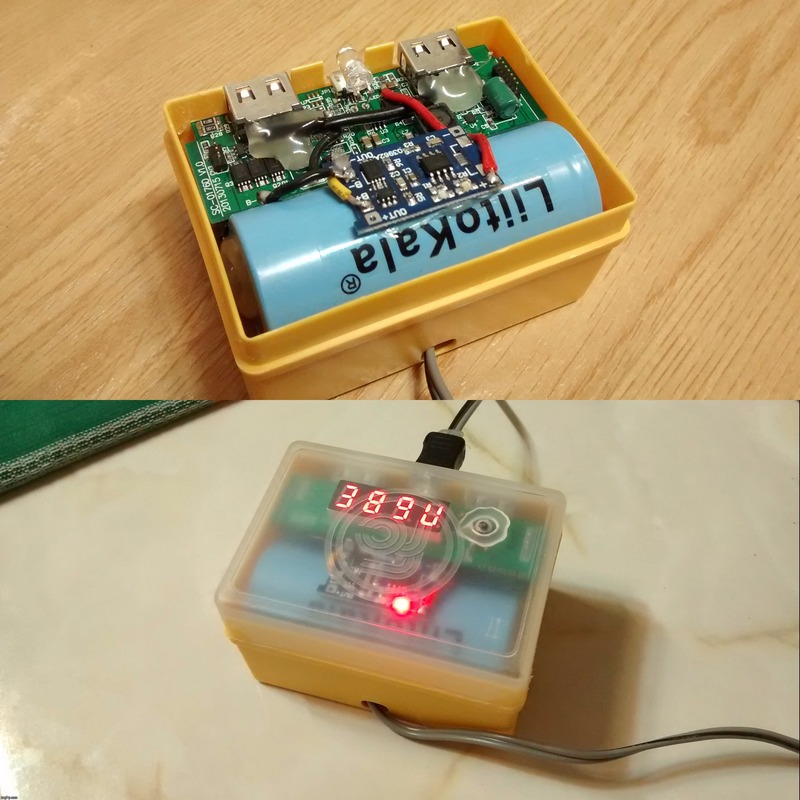 It is a nice module for charging 4.2 volt LiIon batteries, even fairly small ones, the flexibilty in input voltage makes it useful for 6V unregulated solar panels. 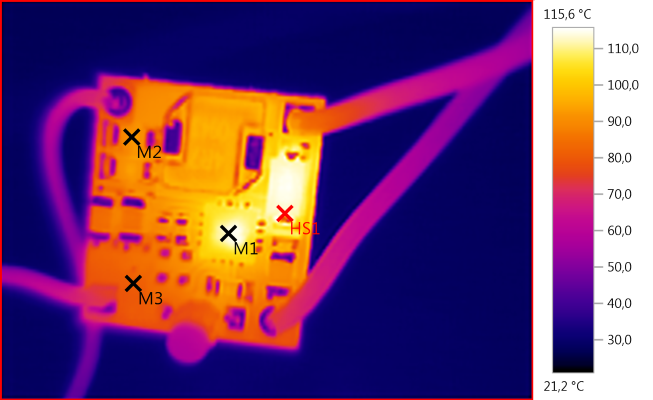 I am not impressed with 2A performance, either a heatsink must be added or one of the resistors must be removed for best lifetime. Thank you for this test! What does that “10% precharge” mean? Never read it before. Edit: Can someone give me a link to this charging circuit? In germany, you only have access to PowerSellers from China – For me, the “wkws20”-Shop is empty. It means it will charge a over discharged LiIon cell careful as it is supposed to be. 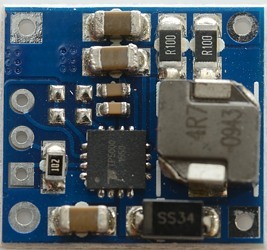 The reason you can disable it may be because the circuit can also be used as a led driver. Is the termination always at 10% of charge current? Hard to see exactly where it is on your 100mA chart. 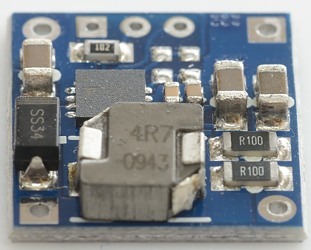 Can someone give me a link to this charging circuit? Thank you very much for the test. 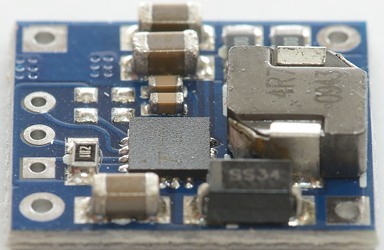 Does this charger drain the battery empty if it is disconnected from the power source and the battery is still connected? Could you use this without the LED? If using Solar power wouldn’t the LED take power away from the charger? 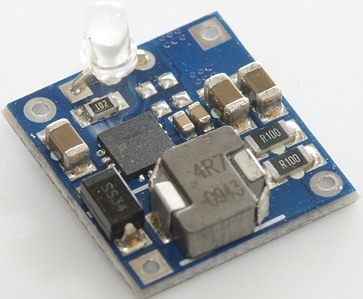 The led do not use much power, but you could leave it out. In retrospect, seems you complained from a too high of a LiFePO4 charging restart voltage, HKJ. 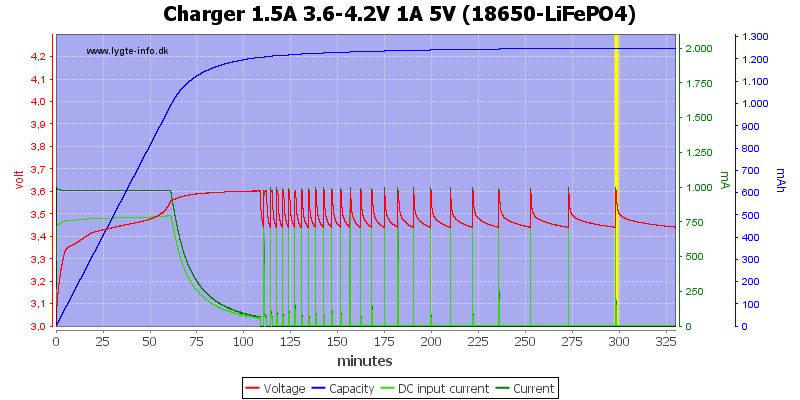 From what I've observed among some different cell reviews, the actual LiFePO4 resting voltage seems to lie ≈3.4V. Of course in series, DoubleA. But you can’t charge those cells in series with that module. Yes, I can't charge 3S 10440 LiFePO4 cells with these modules, DoubleA; I never said I was going to do such a thing (off-topic). Oops, my bad. I thought you were trying to charge multiple cells. I have bought two Sanyo NCR20700B batteries. I would like to charge the batteries by using TP5000. 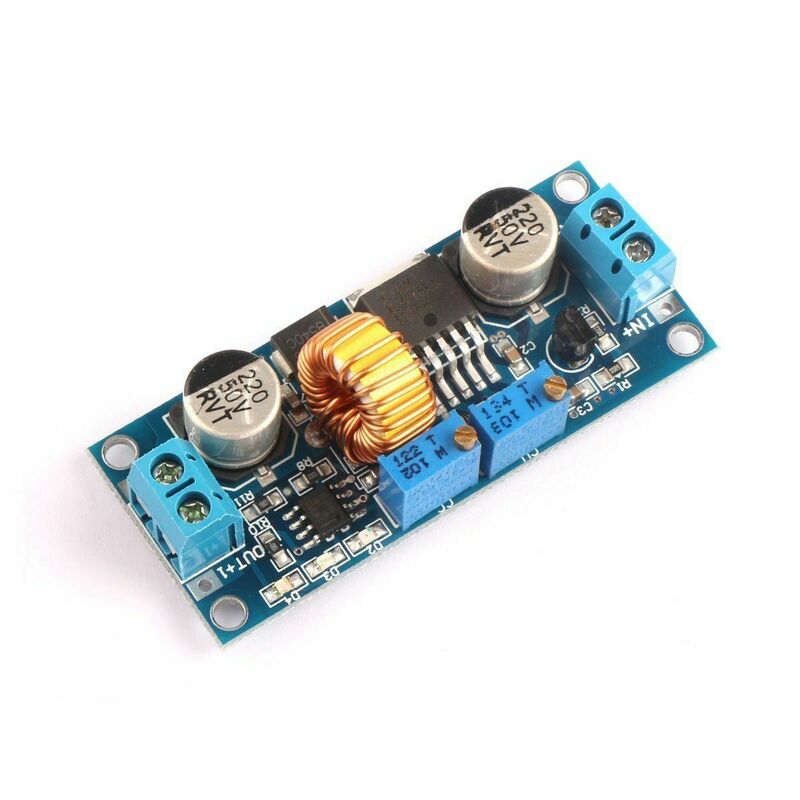 What you think, is this module suitable for the battery? If not could you suggest something else? It would be great charging at 1A. Would work quite well with an appropriate 20700 cell holder, and charge in around 4-5 hours, which would be perfect for the cell. … could you suggest something else? 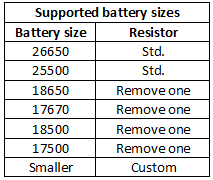 Regarding XL4015, is there any indicator to see whether the battery is fully charged? supersonic, in the above picture two leds can be seen at the lower right board corner; out of these two the one at the left (closest to the LM358) is on when in CC mode, while the rightmost one lights up (and the left one turns off) once the output current has tapered off below 10% of the set ratio at the right (CC) trimpot. 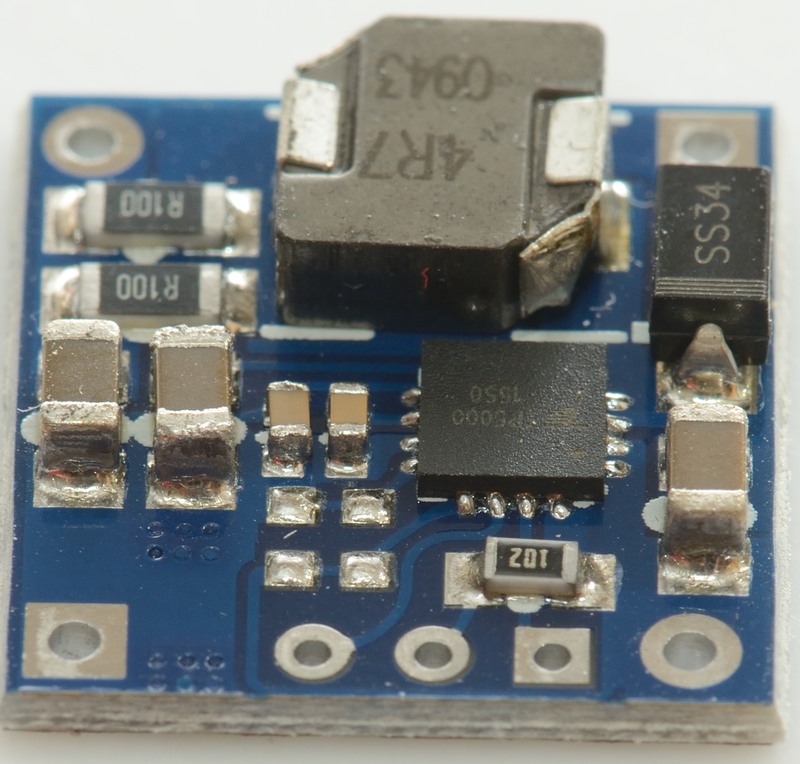 These boards won't work in constant current mode with less than ≈7V of input, bear this in mind though. Originally posted on Thu, 05/17/2018 - 01:23; edited to add extra clarification info. 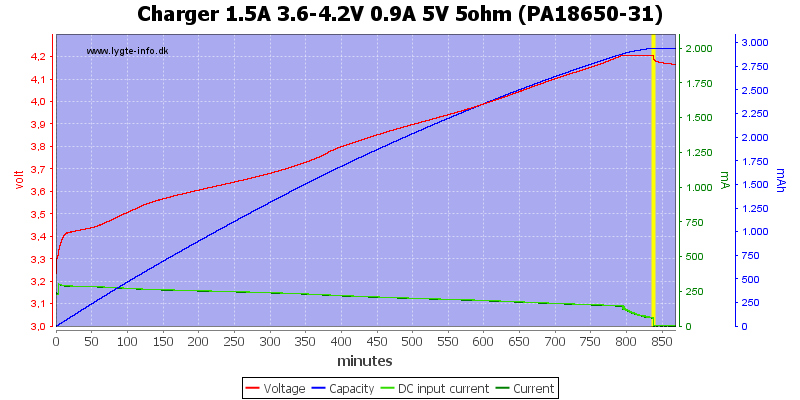 Wait, is that why when I tried to charge super capacitors with a 5V power supply, the current kept going up until the power supply shut off, and not doing it with a laptop power supply? Now I get it. I have 5 of them regular buck converters, and 5 of them which have MPPT operation. These work very well at parallel charging, and safe low voltage recovery voltage at <2V lithium ion cells at 50-100mA. I don’t think you should do that. 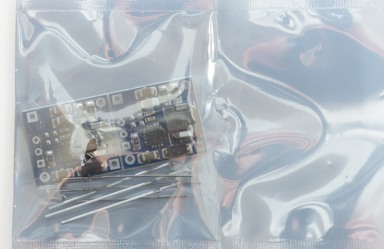 I’ve seen elsewhere that these modules need isolation if powered from the same supply. The above is a custom powerbank I made for a close friend. 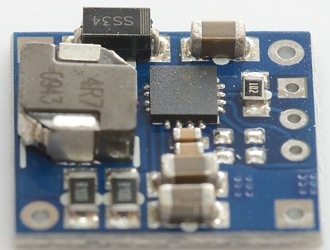 It has a good old PCB featuring a single TP4056 charging chip onboard which can be seen just under the red cable in the photo, besides the onboard 5mm led. As can be seen in the photo I boosted its charging capability with an additional TP4056 board, and that thing is still operating. The powerbank is now housed inside a different transparency box because he once crashed it hard. 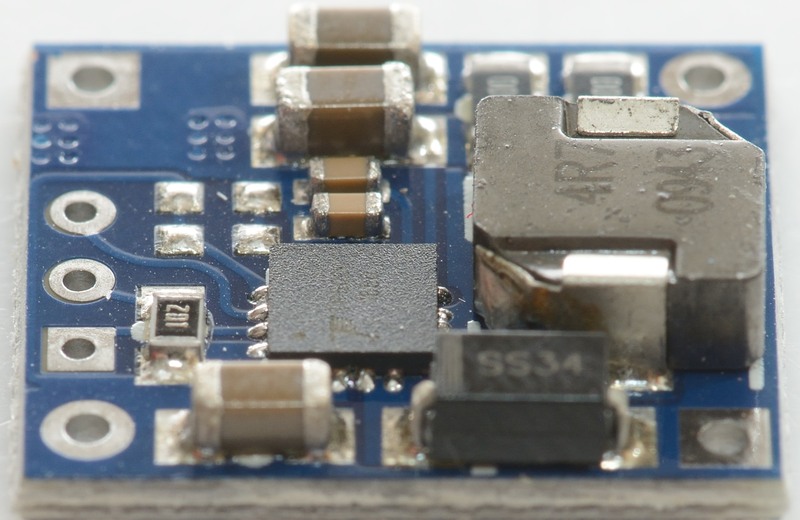 Are you sure these modules will work fine without any issues if you wire them to a common power supply without any isolation? If so then I would like to do that setup with 2 TP5000 modules (the other type, the red one which HKJ reviewed) in parallel to charge 2 LiFePO4 cells simultaneously.